While I was enjoying my post-work out coffee and L’Equipe a little announcement caught my eye. Sebastian Vettel’s been awarded the Grand Prix 2011 from the French Academy of Sports. Well done Seb but that wasn’t what provoked my interest. Among the various awards was one for a Brit, Anthony Smith which recognised his exceptional and original endeavour with a raft! Now the French are masters of extreme sports and there’s a number of Brits who are far more celebrated here than back in Blighty – Dame Ellen MacArthur immediately springs to mind. “You never want to have IF ONLY on your gravestone”. You get my drift and so does 85-year old Mr Smith. Anthony Smith, along with his three senior companions – David Hildred, John Russell, and Dr Andrew Bainbridge – recruited via a newspaper advertisement, realised a long-held ambition to sail across the Atlantic in a raft. The “An-Tiki” was constructed from four water supply pipes nearly 40 feet long, and 14 cross pipes, seven of which held the crew’s fresh water supply. It had a 40 foot mast, a 400 square foot sail, twin rudders, centreboards and oars, but crucially no engine. The adventure was financed by compensation Mr Smith received from being run over by a van which broke his hip and left him needing sticks to walk. 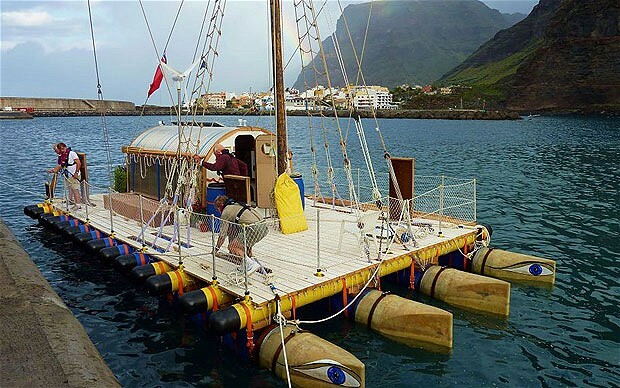 It took them 66 days, averaging four knots per day, to travel the 2,600 miles from the Canary Isles to the Dutch Caribbean island of St Maartan. The crew said they wanted to prove the elderly are capable of embarking on adventures that are mistakenly considered dangerous. They hoped their endeavour would raise £50,000 for the charity Water Aid, which provides potable water to impoverished communities. “’Yes, of course it’s a success,” Smith said with a smile. “How many people do you know who have rafted across the Atlantic? … The word mutiny was only spoken about two or three times a day.” Doesn’t this story just gladden your heart. Leaving aside the road races, the French have always done well on the track and in MTB. Last time out they also shone in BMX. There’s no reason to suppose they won’t do similarly well in London 2012. They’ve been less convincing on the road and could only offer up the diminutive Samuel Dumoulin who finished 3rd in the pre-Olympic dry run. While it’s not entirely impossible that someone of the stature of Dumoulin – and when I say stature, I’m thinking palmares not size – or Feillu could nick a place on the podium. Just don’t bet your shirt on it. This is the lad who won the U23 Road Race in Copenhagen and who’s now a neo-pro at FDJ where he’ll have an opportunity to grow without too much pressure being placed on his young shoulders too early. He’s only 2o (21 in August) and one shouldn’t expect that, like Marcel Kittel before him, he’ll rack up 18 sprint victories in his first season. But he will win races, just not yet. Remember, he was 4th in U23’s in last year’s Paris-Roubaix and will no doubt benefit from Frederic Guesdon’s guidance. The sentiment was that these two will play a role but there are others who will enter the fray. They’ll probably never repeat their respective golden years of 2010 and 2005 respectively. However, I sensed, that nonetheless, this was exactly what everyone was hoping for. Kitty Fondue and I are going to be hotly debating this very topic over on www.velovoices.com. Now I’m not sure whether readers felt this was the most likley and most expedient outcome for cycling or whether, as time has gone on, Contador has impressed everyone more and more with his demeanor thus they’re more inclined to give him the benefit of the doubt. The French are not overly fond of what we might call “the authorities” and this may have just tipped the balance in Bertie’s favour. Despite his excellent team, experience and the favourable parcours, readers felt his age would count against him and, in particular, his declining powers of recuperation. If he takes part, most expect Contador to win. The French know their cycling. Voeckler ended up in the leader’s jersey when he profited from the misfortune visited on Messrs Hoogerland and Flecha. His defence of the jersey was heroic, but he was in it by chance. The verdict: top 10 placing is the best he can expect. Most recognise that Bruyneel does have what it takes to make Andy win the Tour, but not this year. He needs a more favourable parcours, the absence of one Bertie Contador and to be uncoupled from his elder brother. Like I said, the French know their cycling. They’re not wrong about this. While most agreed it would be more difficult than winning the World Championship’s Copenhagen – fewer team mates, hillier parcours – they felt his experience in winning Grand Tour stages, his mental strength and home advantage might just see him grab gold. Can’t get more emphatic than that! History has shown – Teams Sky and Leopard-Trek – that it takes a while for a team to bed down. In addition, when there are changes to a number of key personnel, it takes time for them to become cohesive. A case of too many chiefs and not enough (red) Indians perhaps? Readers think that this could well be the duel of the season particularly in the Ardennes Classics. PhilGil may be numero uno at the moment but let’s not forget Valverde occupied that slot in 2006 and 2008 plus he’s got a point to prove – always dangerous. Frederic Guesdon to win Paris-Roubaix – sadly he won’t be doing that after crashing in 1st stage of the Tour Down Under. Curse of the Journo! Juan Jose Cobo to ride up the 25% incline of le Caitu Negru (16th stage of Vuelta) in his big ring. Bruyneel to stop Frandy from waiting for one another. Peta Todd, Cav’s partner, to become the front woman for Cochonou (cold meat producer) in the Tour caravan. Lionel Messi to take French citizenship and start cycling. (With those sublime feet, he could be a shoe in). Another’s a rather saucy reference to the fact that Mark Cavendish got his partner pregnant during last years Tour. However, it does acknowledge that Cav’s a brill Tweeter. Tom Boonen wins a fourth Paris Roubaix title and snubs Roger De Vlaeminck on the podium. (I know exactly what SHE means, but I’m sure Tom’s too nice to do that). Visits to my family in the UK are such rare occurrences that I never take my laptop with me. Not, of course, that my parents have access to the internet. But, even if they did, I would feel guilty spending even half an hour of the few precious hours I spend with them checking out what’s happening in the two-wheeled world. I’m not completely out of touch, I do have my Blackberry but emails and tweets tend to give me tantalising glimpses of what I’m missing. But I can be patient, every now and then. My last UK trip was in October. This visit was arranged because of its proximity to my birthday, Xmas and ahead of next week’s start of the 2012 cycling season. So for just a few days, while I’m seeing my family, and catching up with a few friends, I feel bereft of my usual daily anchors. The Times is a poor substitute for L’Equipe. But it’s better than nothing, and this week it did feature an interview with Sky’s World Champion, Mark Cavendish (seen right), and the planning and preparation that’s going into (possibly) making him Olympic Champion. A far harder task than securing the rainbow jersey he’ll be gracing all season long. My family sadly don’t share my love of all things two-wheeled, nor do some of my friends, though they all kindly show some interest which I repay by not talking too much or overlong (I hope) about my velo passions. On my return home to the sunshine this morning, there were two items high on my agenda: a bike ride and a quick catch up on what I’d missed during the past four days (was it only four?). So much seems to have happened. A bit of a dust up over who’s on who’s side in the Contador v UCI/WADA decision and the fear that it might be delayed, once again. The wild cards for the Giro have been announced with German Team NetApp springing a bit of a surprise while Acqua & Sapone’s hopes and dreams went down the plughole. OPQS’s Tom Boonen deciding to up sticks and head back to Belgium, passing up on an opportunity to ride with me this winter. He must have had a savage pay cut so the team could pay for Levi Leipheimer and Tony Martin. The route of this year’s Vuelta was unveiled on Wednesday. I’ve planned to be there at the start, shortly after the Clasica San Sebastian but, with the entire race taking part in northern Spain, I am now being tempted to linger longer. I’ve looked at the parcours and winced. This is most definitely a route for Spanish mountain goats, particularly those that weigh less than me. You know who you are! There’s also been numerous team presentations, broadcast over the net, where riders have been forced to wear outfits they’d rather not and assume daft poses for publicity shots they’d rather not. It’s a tough life, even without the hours spent in the saddle. We’re all (aren’t we?) poised in the starting blocks for next weeks’ season opener, the Santos Tour Down Under. The Australian viewing public have chosen their man to follow Vacansoleil’s and 2010 Tour of Qatar winner, “Wouter Mol”, and we’re all chomping at the bit for the action to commence. Fortunately my beloved is going to be heading to the UK on Monday leaving me ample opportunity to view proceedings. The speculation has already started as to who might win but the beauty of cycling is that none of us really has any idea. But it won’t be me. My coach is finally back out on his bike after a six week break with a multiple fracture of the right collarbone. Since he’s supposed to be “taking it easy”, I’m the ideal riding companion. I rode over to his office from whence we set off to undertake today’s training exercises. Actually, we did tomorrow’s, as I did today’s yesterday. I saved my least favourite: pedalling in a high cadence. I find these exercises tiring and they expose my pedalling weaknesses. I have been working on this and my coach felt that I was making some progress. My action is getting more supple and I don’t bob about as much as before. Possibly because there’s less of me to bobble. I did wonder whether my coach would put on any weight during his enforced rest. Well if he has, I haven’t spotted where he’s put it. On his slender frame there’s nowhere to hide. Sensibly, once the wind sprang up, he allowed me to ride in front, while he took shelter. Interestingly, he didn’t indulge in too much “look no hands” riding today. Obviously not keen to get another busted collarbone anytime soon. We discussed my goals for next year. They’re going to be pretty much the same as this year with the addition of a couple of competitive time trials, one of which will be up Col de Vence. I would love to do the Haute Route (Geneva to Nice) and am confident I would have no problem completing the arduous parcours. But everyone else would get fed up waiting for me and I’d probably be consigned to the broom wagon. I have no desire to take part in any event which has more than 500 participants, in truth, even then there’s about 495 too many. So that pretty much eliminates events such as L’Etape du Tour, La Marmote, Bosses du 13 and so on. As part of my training package, I get to ride once a month with my coach but due to his injury we’re now playing catch up. So we’re riding again together next week. This will give me a welcome break from my beloved with whom I’m going to be spending the next three weeks. I know, it’s going to be tricky, but hopefully we’ll muddle through. He’s over in the UK racking up some serious brownie points taking the outlaw out for dinner. His brother’s keeping him company so the outlaw will be in heaven: both her boys together. The great weather’s continuing. I sat outside, read L’Equipe and had a coffee after my 3 1/2 ride before heading back home. This evening was my last English class for a month. Two week break for Xmas, the week after’s the club AGM and then I’m visiting the folks. Wanting to maintain momentum, my two youngsters are finally getting good grades in their English tests at school, I’ve given them a project for the holidays. They’ve got to report on a football match and give me potted stats and bios on five of the players. Knowing these two they’ll plump for a match involving Barcelona. The month’s break will also allow me to restock my supply of cakes and cookies, the cupboard is bare. We’ve reached that time of year when those in the professional peloton are taking a well earned rest, picking up awards and looking forward to next season, some with new teams. Sadly a number are still seeking gainful employment for 2012, while others have hung up their helmets for good. All this means cycling coverage in L’Equipe is limited to a couple of columns each day. After Tuesday’s deluge, the weather gods have been kind and I’ve been out enjoying the warm temperatures, following my training programme and overtaking plenty of tourists on two wheels. Somewhat bizarrely after spending weeks battling with a cold, and it’s after effects, I appear to have hit the form of my life just as the cyclo-cross season gets underway. This week I have posted some of my “fastest ever” times on some of my regular routes. Even my beloved has noticed as I’m managing to stay closer to his wheel on climbs where he often puts a couple of hundred metres into me. Yesterday, I practised time-trialling along the coast road where, a few years ago, I had my first sighting of a professional rider. It was Bobby Julich, then riding for CSC, who whooshed past me on his time-trial bike when I was doing 50kph in the car. I don’t have a time-trial bike, or any of the aerodynamic gizmos, just my trusty BMC. Nonetheless, the legs were pumping smoothly, I was rock steady on the bike and I was flying along. Largely, it has to be said, due to the strong tailwind. I didn’t go anywhere near as fast in the other direction, in fact I was around 10km/hr slower. Having given my all, I retired to one of my regular watering holes for a late lunch. I was joined by a large number of the presidential guard who are billeted, along with their horses, at the nearby Hippodrome, ahead of next week’s G20 meeting in Cannes which Sarkozy will be hosting. Memo to self: avoid riding in the direction of Cannes next week where security will be tight and the traffic will be dreadful. My beloved arrived back from a couple of days in Cairo this morning. I delayed setting out on my Sunday ride to pick him up from the airport and then we rode together. We were too late for the club pointage in Beaulieu and had intended to follow the route of the club ride, stopping to enjoy lunch in La Turbie. But, probably due to the sunny weather, traffic was heavy heading into Nice. We elected to ride in the opposite direction, along the coast, before heading back into the hills. The route included a 2km climb at 12% average: short and brutal. We had lunch at home as my beloved (for once) wasn’t feeling too hungry. He had stayed with friends in Cairo who had literally killed the fatted calf on his behalf. My beloved is off on his travels again tomorrow, this time to UK and Germany until next Saturday evening. You understand that this is not a complaint, merely a statement of fact. While he’s away, I shall be busy. I’m keen to profit from the remaining fine weather as more rain is forecast for Wednesday. Already the hills around Nice are dusted with snow with more forecast this week. It looks as if we’re going to have yet another great skiing season. Today L’Equipe posed what it thinks are the 10 key questions in respect of the 2011 cycling season. The answers were supplied by its crack team of reporters. 1. Will Contador be at the start of the Tour de France? 90% said No. What I want to know is which reporter said “Yes”? Either they misunderstood the question, or they can’t count. The Spanish Federation is not expected to render a ruling until 15 February. Such ruling will be challenged either by UCI or by Contador. TAS takes six months to opine, so Contador will remain suspended until 15 July, at the earliest. When does the Tour start? I rest my case. Of course, being numerate isn’t necessarily a requirement for a journalist. 2. Has Andy Schleck already won the 2011 Tour? 80% said No. Again, which two journalists think all he has to do is turn up? Andy’s going to find being the favourite a whole different proposition. He’s not going to have anyone to take the lead. Instead, other riders will be watching him, waiting and pouncing. There are a couple of things in his favour. It’s a course suited to climbers, with relatively little time-trialling. Andy, despite being on a new team, will be surrounded by those with whom he is familiar and whom he trusts, including his older brother. 3. Are we seeing the emergence of a better generation of French riders? 60% said Yes. I think the French are right to be optimistic. They do have a large number of promising, younger riders who have shone at the junior and U23 level. But that promise has to be carefully nurtured and not snuffed out by the weight of expectations. 4. 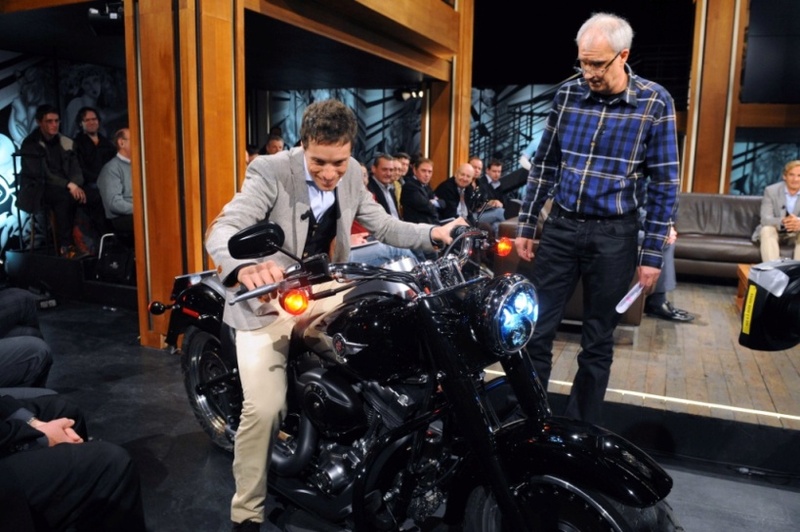 Will Philippe Gilbert be the King of the Classics? 80% said Yes. Again, it’s hard to disagree with this one. He’s only 28 and coming into his prime. He’s capable of winning races on the Cobbles and in the Ardennes and, indeed, throughout the season. But, please, don’t forget Spartacus! 5. 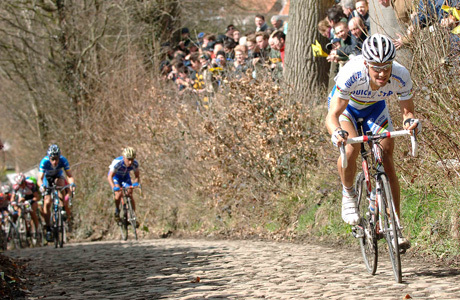 Is Boonen in decline? 70% said Yes. A counter-point to the question above. His last three seasons have been disappointing in terms of the number of wins. He was clearly at the top of his game at the start of last season but lost out in the key races to Cancellara and Freire, before injuring his knee. At 30, he cannot expect to be as prolific as he once was but I’m sure we’ll see him picking up sprint wins in his favoured races, and at least another Cobbled Classic. 6. Will Team Leopard crush everyone this season? 80% said Yes. I suspect this is based on the assumption that Team Leopard will morph back into the winningest team a la CSC. However, the peloton has not stood still: witness the coming together of Garmin and Cervelo, the maturing of Sky, the continuing strength of Liquigas. I’m not sure I agree with this one. Moreover, I’m beginning to think I’ve identified at least one of the two journalists who are Schleck fans. 7. Is Mark Cavendish more than a great sprinter? 80% said No. Yes, I know he’s a bit of a chippy bugger but he has won Milan-San Remo and, while he’ll never win any of the Grand Tours, he might well win other Classics. It’s true that he is the finest proponent of pure sprinting in the peloton and has to be considered among the favourites for the Championship course in Copenhagen this year. 8. Will cycling regret Armstrong’s retirement? 60% said No. I sense a few fence-sitters here. Whatever you think about Armstrong, he’s a larger than life personality who polarises opinion. He’s probably the only person in the sport capable of getting 10,000 people to turn up to ride with him on the basis of a message on Twitter. All sports need personalities, cycling has too few. 9. Romain Sicard, will he come good in 2011? 60% said Yes. What did I say about the weight of expectation? Luckily, Sicard has a mature head on young shoulders and he’s being properly developed within the Basque, Euskatel-Euskadi squad. 10. Will Ricco generate more interest in cycling? 100% said Yes. Spot on, again he’s a very talented a chap who divides opinion. But like Basso and Vinokourov, he’s served his time and has returned to the peloton with a point to prove. A bit like Armstrong, I’m not sure I’d want to find myself sitting next to him at dinner, but he certainly provides plenty of fodder for the journalists. Whether or not you agree with the august views of L’Equipe, 2011 is sure to be a great season. While there’s plenty of emerging talent, there’s also plenty of mature riders, unwilling to hang up their cleats, who are still capable of mixing it with the best of them. Like many fans I have grave concerns over the current business model employed by many of the teams. While cycling is becoming more professional in its approach, it still has a long way to go to enjoy maximum credibility and commerciality. Cycling is a great medium for building product awareness on a global scale, at a reasonable price, but you must have exposure at the world’s biggest race, The Tour. All in all, I had somewhat of a frustrating day yesterday. First off, the weather was fantastic and the road was definitely calling. But Monday’s a rest day on my training programme and I’ve learnt to appreciate that rest is as important as training. It’s also the day I set aside to deal with administration and I skip it at my peril. The morning passed reasonably well. I had sorted, analyzed and prepared everything to drop off at my accountants for the 4th quarter and, all important, year end. So far so good, I rewarded myself with a coffee and a quick read of L’Equipe. When I got back home I discovered the postman had left a gi-normous box at the front door. I say postman, it must have been postmen. It was my delivery from Amazon with numerous cookery books: all very heavy tomes. Of course, I wanted to tear open the box and dive in. I resisted temptation. Postman Pat had also left me a parcel of chocolates: a belated Xmas/birthday present from my German friend who lives in the UK. It was lots of little squares of chocolate, lots of different delicious flavours, with which to give myself a little reward, from time to time. Ok, so there’s no chocolate allowed on the regime but if I don’t put it in my food diary, she’s not going to know, is she? I packed my briefcase and headed into Nice. One of the club members kindly prints the brochures for the Kivilev, for free. I had everything I needed, or so I’d been assured at last week’s meeting of the Kivilev Committee. It was just a case of making the changes to last year’s brochure and rolling the printing presses. I was planning a wee overhaul of the typefaces. My predecessor had used seventeen different ones, in a variety of sizes and colours. He’s a bit like a kid let loose in a sweetie shop, he doesn’t know when to stop. Since I’m of the “Less is More” school, I planned to unify the fonts and colours to make the brochure less of an eyesore. I finally found the printers but couldn’t find a parking spot, even with the Smart. Eventually, I parked about 500m away and walked over. The reception was unmanned but there was a lady shuffling papers in the room behind. She studiously ignored me. Obviously, not the receptionist who had gone AWOL. Ok, I get it she was trying to make a point. I rang my clubmate to let him know I was in reception and he said he’d be down in a (French) minute. Because I’d seemingly waited patiently, the paper shuffler came out of the office to ask me what I wanted. I explained that I had a meeting with my clubmate. She informed me that he wasn’t there. Furthermore, she’d not seen him for some time. Unperturbed, I replied that I’d spoken to him and he’d be here soon and so he was. We went upstairs where he introduced me to one of his colleagues who was going to assist me. I gave them the key with the new documents and started to explain about the changes. They enquired where was the “Master Document”? They didn’t have it, it had been retained by my predecessor. We tried to contact him but he was playing boules and couldn’t be disturbed. I left him a pithy message on his mobile phone. In the event that the “Master Document” couldn’t be located, we hatched Plan B. I left and promised to return later in the week, either with the MD or Plan B completed. I had assumed that I’d be at the printers until 7pm. I was planning to have dinner in Nice and then pop along to the F.S.G.T. meeting to pick up some licences. My plans had now been scuppered. I returned home: 300 minutes of my precious time having seemingly been wasted. I was not a happy bunny. I worked all afternoon on plan B, casting lingering glances at the box of goodies: the books not the chocolate. I then returned to Nice to find the HQ of F.S.G.T. one of the three federations to which the cycling club belongs and the main organiser of races. Again, a parking place was hard to come by so I left it in a cycle lane. I had just hoped to slip in, pick up the licences, pay and leave. I should have known better. These are meetings to be relished, spun out and endured. Everyone was seated around an enormous U-shaped table. On the one side were guys with the physiques of tight-head props, on the other the skinny cyclists. Clubs without a representative were named and shamed. I was easily identified as the “woman who makes delicious cakes” and, I could tell, they were most disappointed that I’d not bought any with me. Note to myself to remember to take some with me next time. Despite the lack of cake, they kindly dispensed with my club’s business first so that I could go and retrieve the car. I then drove over the other side of Nice to the restaurant of one of the members where I had promised to drop off his licence so that he could race this week end. The restaurant was closed. Fortunately, I had his mobile number. I called and left (another) pithy message. I returned to the car and prepared to drive off. He rang me back and, as he lived opposite the restaurant, popped down to retrieve his licence. I drove home, opened both boxes of goodies and indulged. They were delicious. I was saddened this week to learn of the untimely death of Aldo Sassi, one of the most reputable cycling trainers, based at the Mapei Centre in Varese. It was he who had worked with Cadel Evans to lift the rainbow jersey in 2009 and had assisted Ivan Basso in his quest for an untainted maglia rosa. Additionally, Sassi believed in a rider’s clear commitment to goals which needed to be shared with and understood by his team. Lastly, he believed that mental and inner strength were the all-important factors. Sassi was recently criticized for working with Riccardo Ricco. Frankly, I thought, given Sassi’s sterling reputation, it was a stroke of genius on Ricco’s part to commit to working with him. Sassi said ” I think I made a good choice in selecting Riccardo Ricco. I am sure of it. He has the motor, the car, but the driver is not completely there. I am going to help him build his mental strength and self-belief.” Sassi is to be lauded, Ricco has paid the price and, like everyone, deserves a second chance. If it was left to Pat McQuaid, UCI President, he wouldn’t, however, be getting a second chance. McQuaid was quoted in L’Equipe this week as saying if he were a team manager, he wouldn’t hire Ricco. I suspect that Vacansoleil have hired Ricco because he will garner them plenty of points in the all-new UCI ranking system and help them stay in the sport’s first division. Remember, Mr McQuaid “what gets measured is what gets done”. I’ve already blogged on this very topic but frankly it’s hard to support a system that seems to drive away rather than attract sponsors. It’s even hard to get sponsors to commit if you can’t guarantee inclusion at the world’s best races. Pegasus Cycling recently lost a sponsor but have fortunately been saved at the nth moment by another. Rumours abounded that Geox, both a new sponsor and a global brand, might pull out after being excluded from the first division, despite ranking ahead of teams that have been included. This problem has been best articulated (IMHO) by Jonathan Vaughters in his blog on the cyclingnews.com website entitled “The Geox Paradox” where he highlights the current issues in sponsorship. This man knows what he’s talking about, you cannot say that of everyone involved in the sport. My deepest sympathy goes to Aldo Sassi’s family, friends, clients and colleagues: the world of cycling has suffered a grave loss. There’s been a collective weeping, wailing and beating of breasts in France today after their football team lost 2-0 to Mexico. Most have them on the plane home already. I’ve no idea what L’Equipe made of it as there were no copies available today in the local newsagents. Maybe, they decided not to publish in protest. The Nice Matin called it “Honteux” (disgraceful) and most players, with the exceptions of Lloris and Malouda, who both scored 5, were awarded less than 4. I think the manager was a definite “nul” points. Still, that’s not been the only surprise. I watched a bit of the Spain v Switzerland game. The Spanish were passing the ball around beautifully while the Swiss employed that time honoured tactic of the underdog: 11 men behind the ball. It worked. Casillas, the Spanish goalkeeper, fell asleep from boredom and let in a Swiss goal. Germany, who started brightly by scoring 4 goals in their first match, lost Klose and went down 1-0 this afternoon to the Serbs. England, meanwhile, laboured against Algeria, a team you could buy with the sale proceeds of Emile Heskey and still have change over. We’ve maintained our unbeaten run, but I’m pretty sure this was not what Fabio Capello ordered as his birthday treat. At times there was more action from the bench than on the pitch as he agonised, grimaced and gesticulated over England’s performance. While David James looked commanding in yellow, back in his rightful place between the goalposts, the same could not be said of many of his teammates. Rooney was rubbish, Lampard lacklustre and Gerrard, by his own admission, lacked courage. It’s still all to play for next Wednesday afternoon against Serbia, a team that has already beaten Algeria. The pundits have worked out that if England draw 2-2 against Serbia, and USA draw 0-0 with Algeria, the winner will be decided by drawing lots. Given our luck with games of chance and penalties, we’ll be keeping France company on the plane back.